It is the 1880’s, Minneapolis, Minnesota is ideally situated along the Mississippi River near the powerful Saint Anthony’s Falls and is in close proximity to the Northern Plains. The combination of these two features propels the city in flour production and earns it the moniker of Mill City. 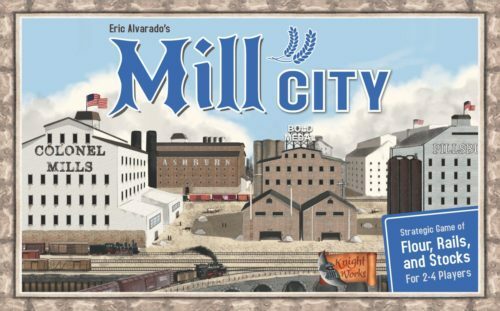 In Mill City, players each represent a milling company and are responsible for producing flour and shipping it via boxcars to distribution centers. The milling companies must use the Saint Anthony’s Falls to produce the water power needed to mill grain into flour. After milling is completed, the flour is loaded into boxcars and shipped to distribution centers in the Midwest. The player who can successfully balance milling and shipping based on the available water power and shipping capacity, and invest in the rising distribution companies will be victorious.